Our team has grown organically over the years and is a simple, happy bunch. Some of them grew up on the hills of our land and know beauty when they see it. The team is headed by our store manager, Asuntha Francis who has been with the store since its beginning 19 years ago. She is supported by an Assistant store manager, Rukmini who has been with the store for close to 10 years. They are ably supported by Manoj, Keshav, and Biru who are primarily in charge of designing beautiful bouquets. Uday and Babu are in charge of floral care and help in conditioning the blooms. Madhu and Murugan are in charge of logistics and deliver these beautiful blooms at our customer doorsteps. Almost all of them have been with Ohana for more than 5 years and together, they hold the key to our continued growth. 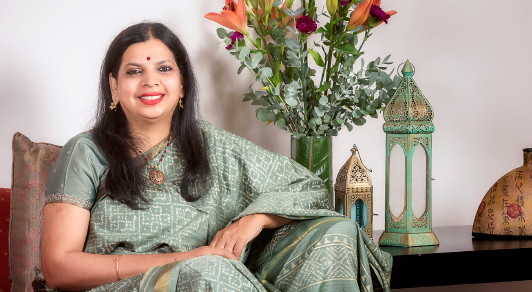 Padmaja Kamisetty, the owner of Ohana, shares how she stumbled into leading and growing a flower company in 2004. She has created a new venture in 2015 to go into wedding and event décor, going way beyond flowers. But, flowers continue to be her muse. 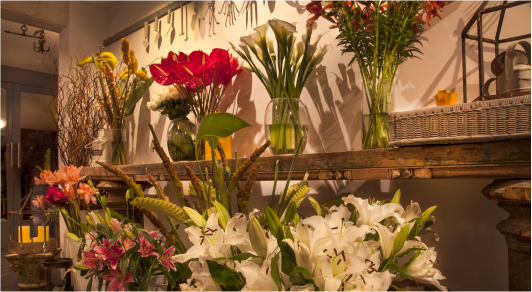 Serendipity best describes how I got into owning one of the premium flower boutiques in Bangalore. I graduated in agricultural sciences which gave me the initial exposure to horticulture and floriculture. When I got married and went to the US, I mastered in Agribusiness, which is an offshoot of Agricultural Economics from Arizona State University. I was also keen on gardening and Portland was the right place to grow a variety of flowers, be it lilies, dahlias, irises, roses and a wide variety of perennials and fruits such as apples, peaches and plums. Back in India, my interior designer put me in touch with the founder of Ohana and something clicked - both of us were flower lovers and she made me an offer I couldn’t refuse : to take over her flower business. Never in my wildest dreams did I imagine that I would own such a beautiful business. Though exposed to the academics of agribusiness, I had no idea how to run a business. There has to be a beginning for everything. This was mine! My time at Ohana has taught me that this is truly a passion-driven business and that the product has to be fantastic, should offer creative choices and unique packaging. A deep understanding of the flowers and the clients sets you apart and stands you in good stead in the long run. I also experiment with fillers and flowers by growing some on our farm nearby. We are eagerly tracking the trends in the fashion, architecture and interior design industries to deepen our understanding of colors, textures and of course, spaces. I have had the privilege of guiding Ohana’s trail blazing journey so far. We strived to create new standards for product excellence and customer delight in this industry. We and our customers share a passion for elegance, beauty, excellence and for creating wonderful memories. I continue to derive my inspiration from gardens and boutiques around the world.